In the National Museum of American History in Washington, there is an exhibit presenting American identity. Next to Mickey Mouse is the gavel with which Abraham Lincoln abolished slavery, and next to Marilyn Monroe’s gloves there is the table at which the decision on women’s voting rights was taken. The display shows how easy it is to be conditioned to the European chronological and hierarchical manner of choosing and displaying the essential parts of a narrative. The idea that a single theme could be approached from the widest range of directions possible was aroused by this museum visit. The goal became eclecticism, avoidance of pure style. This is underlined in small paintings realized as directly as possible from seemingly different themes. The thematics are associated with the loss of a feeling of security, seeking, the utopias, idealism and the notion of the home and homelessness. Here the home is an ideal, a partly impossible fantasy of integrity and security. The mind is capable of considering itself to be elsewhere and of creating places. Fantasizing about a better place is an idealistic and ideological possibility. In a traumatic situation, the mind protects itself from overload. Both fantasy and denial will thus have an important role for survival; the mind needs fantasy in order to withstand reality. So-called reality and the imagined are not distinct; one takes place in the other and vice-versa. An illusion of an imagined place can be painted on a two-dimensional surface with colour, by pouring and dripping and brushstrokes. The painting is marks on a surface, a window, an illusion and an impression. It represents at the same time itself and something else. If Paavo is in an empty room with a painting, what is the space in which Paavo’s experience takes place? Is he spending time in the room or the painting? That probably depends on Paavo. The viewer reflects him or herself onto the painting, thus making it also a projection. Un peintre peut tout dire avec des fruits, des fleurs, ou même des nuages. Quand ça y est, ça y est. Quand ça n'y est pas, on recommence. Tout le reste est de la blague. As an event, painting is intuitive solving and conscious consideration of what influences what. It is concentration and faith in painting, in solutions that one cannot argue for in the process of making the work. To argue for something is to ask for permission, to rely on something familiar, and that cannot be the goal of work. Part of seeking the realization of a piece is staring and perceiving what is seen. Occasionally, the goal is to create a good red, and occasionally to approach the banal without being banal. The motifs have been chosen quite freely. Dreams of form representing itself or of pure conceptualism represent utopia. The relationship of form and motif, like that of image and word, is the inbuilt theme of the paintings. Form is occasionally made the motif of emotion; emotion can achieve form. The empty is in a relationship to the full; the translucent to the opaque; a fast mark to a slow one; red to green. A painting is worth looking at. The starting points and ideas are always something else than the painting itself. 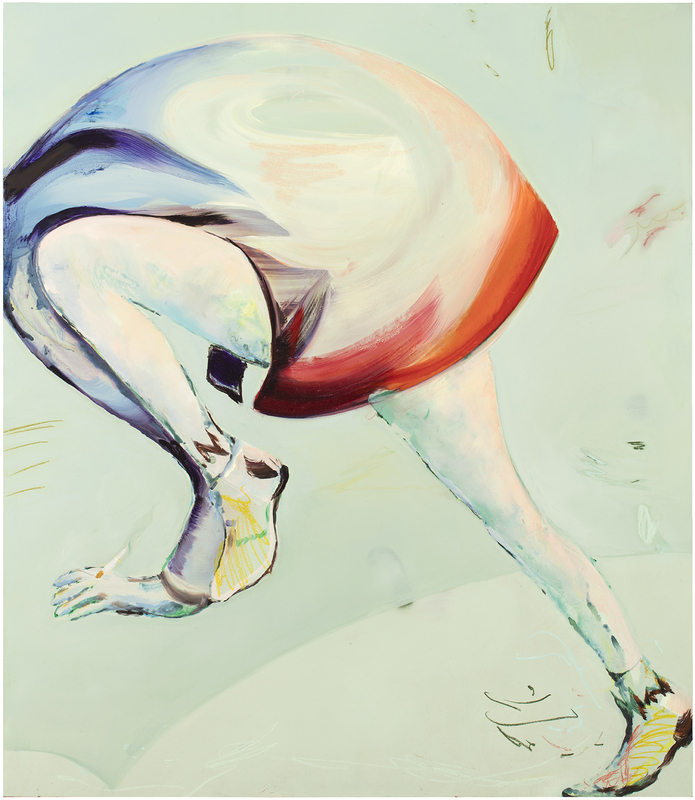 Standing before Anna Tuori’s paintings is a little like being Alice, peering through her looking glass. Each composition presents us with a eld of solid colour, in the centre of which, through undulating strokes of oil paint, a snowy landscape appears. It is as if the monochromatic acrylic has been wiped away, like steam from a bathroom mirror, to reveal a secret, interior world. Like Alice, we find ourselves facing the inverse of our own world: there is snow in place of our dry landscape; bare European pines for our owering gum trees; an open, empty vista in contrast to the closed-in interior of the gallery. Most importantly, there is space for the viewer to imagine their own apparitions and illusions, inventing a personal narrative for Tuori’s ambivalent scenes. Tuori is interested in the concept of the ‘Das Unheimliche’, or ‘uncanny’; the point at which the familiar starts to become strange. The longer one stands before one of her paintings, the more one gradually begins to see. Her dreamlike environments appear almost on the threshold of being recognisable, but details are hard to make out through the washes of paint. The three works included in the Biennale of Sydney (It’s All Now You See, Nobody Knew My Rose and Blow Out Your Candles, Laura (II), all 2013) are united in their depiction of a barren snowy landscape, with the inclusion of a structure in which to shelter from the cold. A human presence is hinted at with the odd smudged handprint, or through splotches of paint in anthropomorphic shapes, dotted here and there. On the surface, her paintings appear innocent – fairytale scenes in candyfloss colours – but there are secrets in these forests; all is not as it first seems. For Tuori, her landscapes are not merely fantasies, but fantastical realities. With space for the viewer to project their own emotions and reach intuitive interpretations, each painting is like a portrait of the human mind. Every visitor will see something different, based on their personal experiences and memories. Tuori’s suggestive paintings provide a kind of visual puzzle, which, neuroscientists have recently informed us, the creative parts of the human brain enjoy and employ. Tuori’s titles may be borrowed from literature, her thoughts informed by theory, but her work is above all a visual and perceptive experience. Like children making out compositions in the clouds, so too will the attentive viewer recognise their own associations in Tuori’s brush marks. From the development of linear perspective during the Renaissance, until impressionism broke the illusion with its pointillist brushstokes, the purpose of painting – as a primary means of visual communication – had been to present a window onto the world. Two-dimensional surfaces convincingly re-created three-dimensional scenes. Following the onset of photography, which replaced painting as a means to faithfully depict reality, painters began to work with this paradox; acknowledging painting’s ability to represent something while also revealing itself. Tuori continues in this tradition, using different techniques to demonstrate the medium’s capacity to combine what she has described as the concrete and the imaginary. The concrete is evident on the painting’s at surface, in Tuori’s planes of block colour, and brush marks that reveal the method of the work’s creation. The imaginary is the result of all these painterly techniques coming together to create the depth of a poetic landscape. Tuori’s artworks fall into the tradition of romantic painting, with nature used to reflect an interior world. Yet, to categorise her so simply feels too limiting. Tuori’s paintings are not only manifestations of the artist’s emotions and imagination, but also of our own. We take from her work what we alone bring to it, allowing ourselves to become lost in the world through the looking glass, only to return to reality as if from a dream.